We’ve had some exciting new feature releases this month, especially when it comes to our best-in-class bug reporting product. We’ve also iterated on our major in-app survey releases from last month, while we continue to move our crash reporting product ever forward. These product updates aim to address the most common pain points app developers face when it comes to fixing bugs and crashes. They also include user feedback features that help keep app end users engaged to increase time on app and boost retention rates. Let’s dive in. This month, we’ve released several new bug reporting features that aim to solve some of the most common problems faced by app developers when it comes to fixing bugs. Last month, we introduced a new error message in bug reports that highlights failed network requests in order to help our users identify and fix problems faster. We’ve iterated on this feature and now, we alert you about the three most common network request errors: network request failures, network requests that timed out, and network requests that took too long to complete. Understand issues clearly with Extended Bug Reports. One of the most time-consuming and challenging pain points we’ve heard from our users is dealing with bug reports from their end users that lack necessary information, don’t provide enough context, or include irrelevant details. We’ve found that having standardized bug reports saves 45% of developers’ time, which is why we’ve introduced Extended Bug Reports. 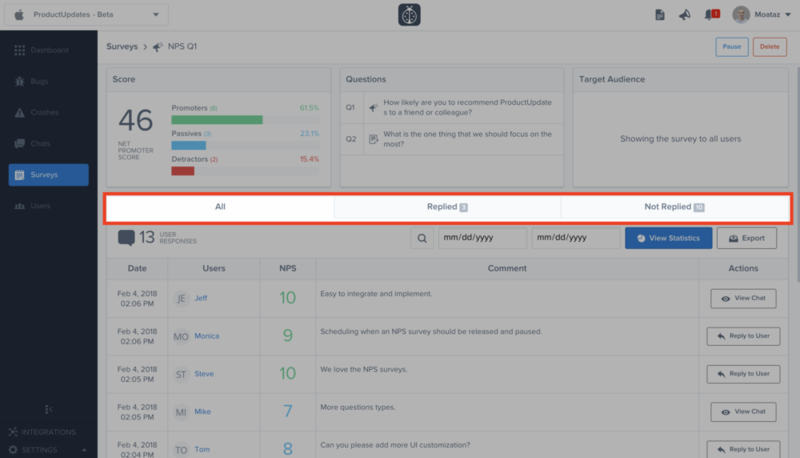 This new format includes sections that prompt your testers and users to detail the steps they took in order to reproduce the problem, the actual results they see, and the results that they expected to see. Coupled with the bug details and logs that we provide, you’ll have everything you need to know to fix bugs faster. See our documentation for the relevant APIs: iOS and Android. Sort and distribute bugs and feedback faster. Another common bottleneck our users have shared with us is categorizing Instabug reports. 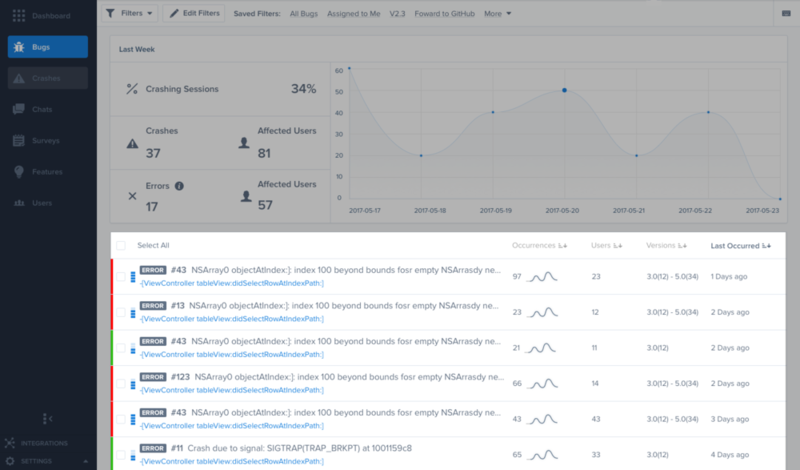 Wether you do this in the Instabug dashboard or forward issues through our integrations with third-party platforms like Jira or Zendesk and classify them there, one person or team still has to read through every report in order to categorize them. 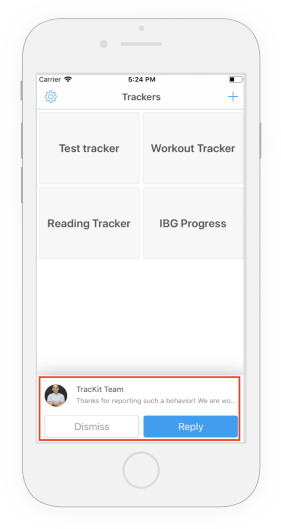 With bug reporting and feedback categories, you can prompt your app users to self-select the appropriate category of the issue they are reporting before they even submit their report. 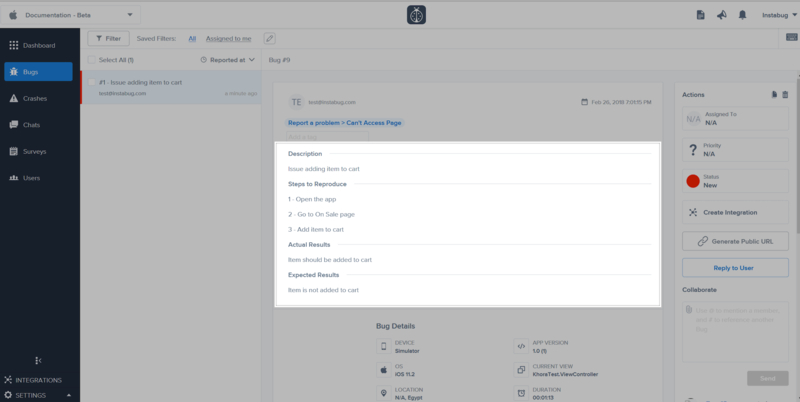 This way, issues are automatically categorized according to your needs and you’ll be able to send them directly to the relevant person or team handling those problems, like support, engineering, design, or content. Once a report is submitted, its category will appear above tags, as shown below. Learn more details about report categories in our documentation. More visible and interactive in-app notifications to keep your app users engaged. Instead of appearing at the top of your app users’ device screen and disappearing after a few seconds, in-app notifications now appear at the bottom of the screen. They also include “Dismiss” and “Reply” buttons, which allows your app users to read the information in the notification on their own time and dismiss it when they’re ready, or conveniently reply directly from the notification if they so desire. Bug reporting and in-app feedback for React, Cordova, and Xamarin apps. ? 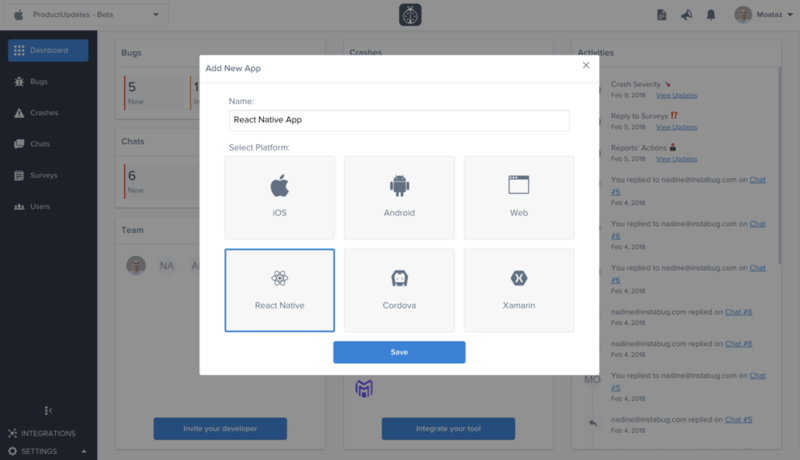 Instabug now supports React Native, Xamarin, and Cordova app creation through one click in our dashboard. Expect to see more features and functionality for cross-platform apps in the coming months. You’ll receive one token to be used in your initialization code, and all your bugs and chats will be grouped in the same place. See our documentation for more information about integrating the Instabug SDK for React Native, Xamarin, and Cordova apps. We’re moving our crash reporting product forward. To help our users maintain high-quality apps, we’re rolling out new crash reporting features and enhancements, including these below. Fix urgent crashes faster. Immediately see the severity of any given crash according to four classifications: low, moderate, major, or critical. When a crash is reported for the first time, its severity is automatically set as “low”. Based on several parameters, including the frequency of the crash, the number of affected users, and the recency of its occurrence, we then automatically and continuously reset the severity to “moderate”, “major”, or “critical”. Crash reporting is available starting from Instabug’s Bronze Plan. Interacting with your end users and providing excellent support keeps them engaged with your app and raises retention rates. For Silver Plan Instabug users, you now have the ability to reply to your app users who experienced a crash. You can use this function several ways. Notify all users affected by a crash that you’re aware of the problem and are working on it. Or let affected VIP users know that you’ve fixed the crash. Or ask users who reported a specific crash for more information to help reproduce and fix it. 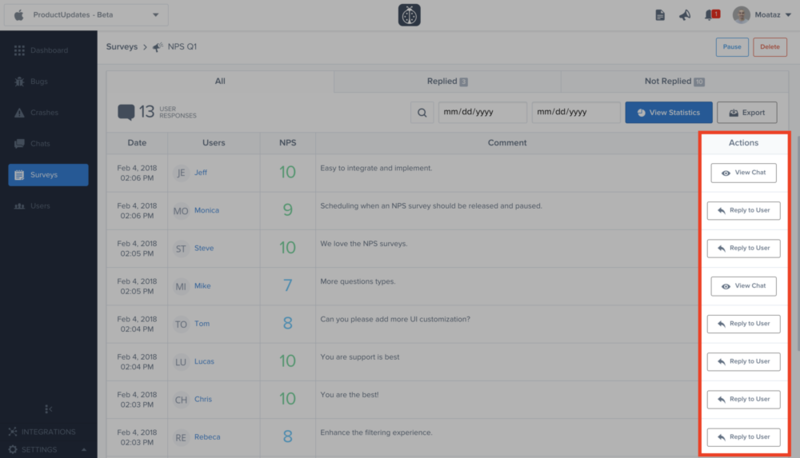 Last month, we introduced some major in-app survey features, including NPS Surveys, Star Ratings, and Custom Targeting. We’ll continue to iterate on our in-app surveys product, including the addition of this function below. Close the loop with your survey respondents. Reply to any of your app users who completed a survey to let them know that their voice matters. Thank your survey respondents for their participation or dig deeper and ask for more details to better understand their thought process and motivate them to engage with you even more. You can filter survey responses to focus on the users you already have an open thread with or the ones you haven’t replied to. Your users receive your reply within the app as a new thread initiated by you. To give them context, the initial message in the thread refers to the survey questions and their answers. Replying to users is supported starting from Instabug’s Silver Plan. Learn how Instabug can help you iterate faster, build better apps, and drive five-star reviews through bug reporting, crash reporting, and in-app surveys.